In the entrepreneurial world, I have heard so many stories about people and their ‘past lives.’ Many of these individuals used to live in the corporate world, hungry for a creative outlet. Samantha and Courtney, owners of Dime and Regal in Grand Rapids know this narrative all too well. 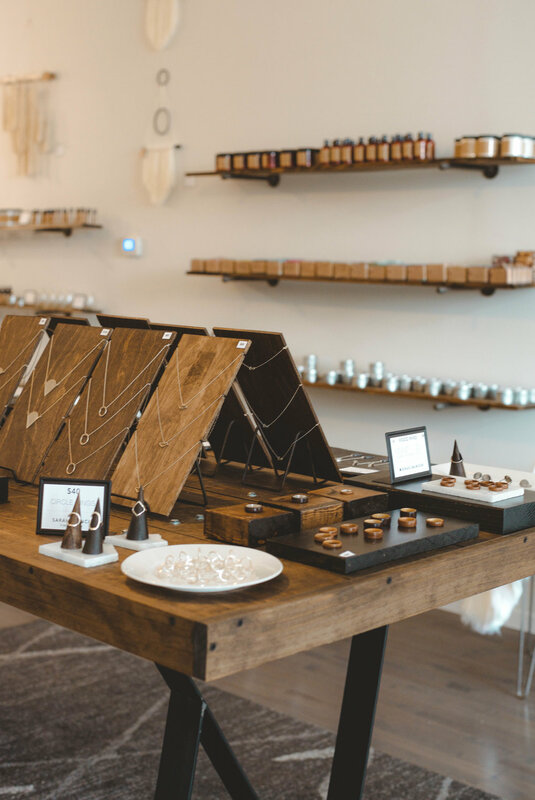 You wouldn’t picture a former marketing professional and pre-med student as jewelry makers, but the store is a picture of what it means to follow your true calling, even if that wasn’t your original path. 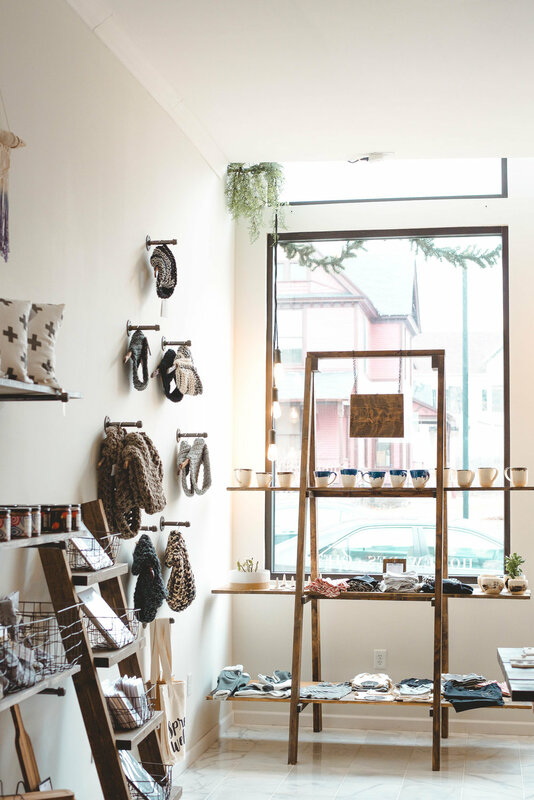 Their own lines blend with many local artists to create a store of unique, quality made products. They curate the collection with care and intentionality both for their customer and the creators their storefront represents. 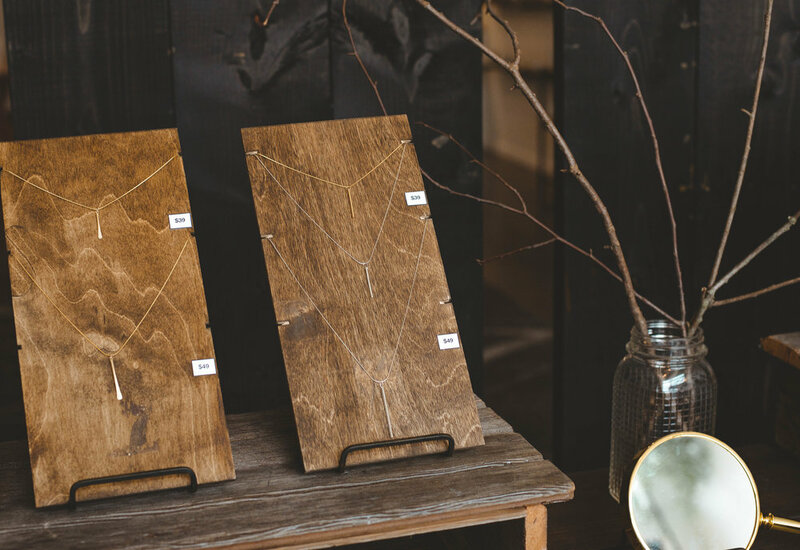 Their collection is approachable and simple, but are the kind of pieces that make a statement in your catalog treasured items. 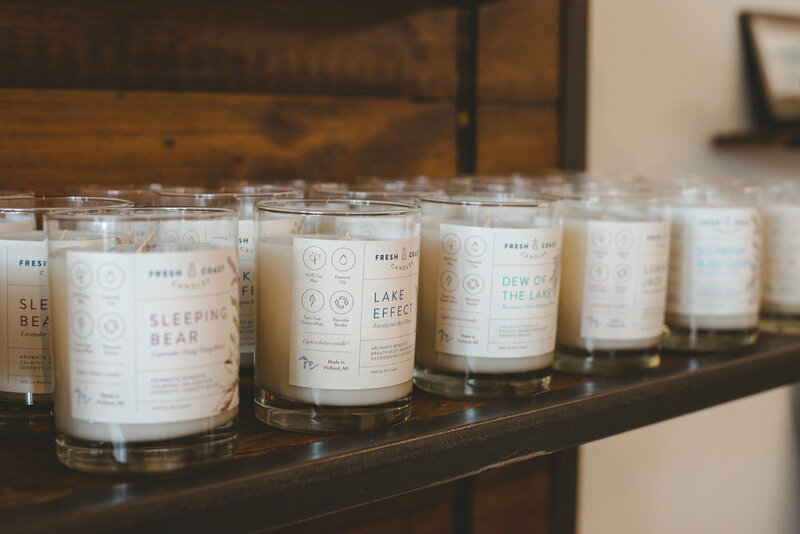 I loved wandering the store which feels like a gallery for anything from hand lettered prints to comforting candles. 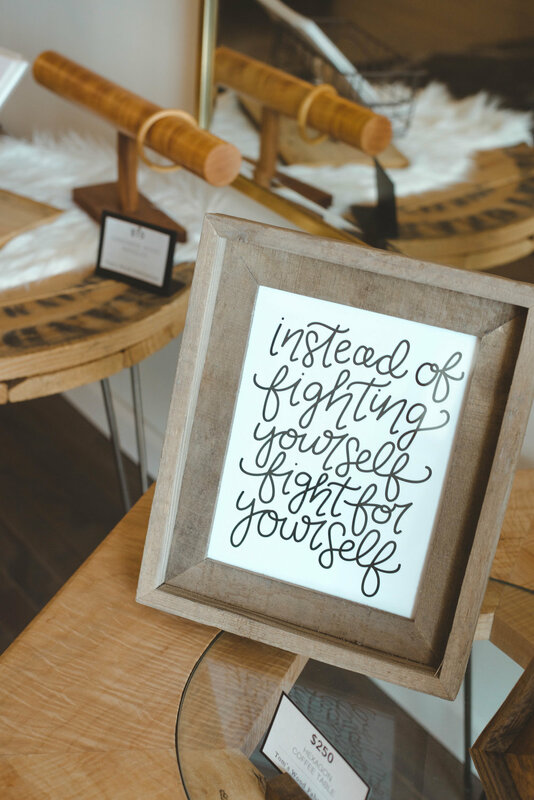 I sat down with Samantha and Courtney in their new storefront on Wealthy to hear more about the formation of their partnership and their individual stories of finding your way back to your creative soul. What is the story behind the shop and your partnership? C: I graduated from Grand Valley after studying Art and Design. After school I took a corporate Marketing position and it wasn’t me. I ended up getting fired and started making jewelry and selling it to pay my rent. It was essentially out of necessity. As I continued with that I discovered so many friends who needed to sell their items as well and here we are with the store. S: I actually went to school to be a doctor. I have always been an artist at heart. I came from a traditional family where it was kind of like you have an intelligent brain, you should use it for something specific. I took a metalsmithing course my senior year of college and ended up moving to New York. I worked for some larger designers in the city and fell in love with it. My ultimate dream was to create my own line and have a retail space. After New York, I moved back to the Midwest, had children, and eventually got connected with Courtney. 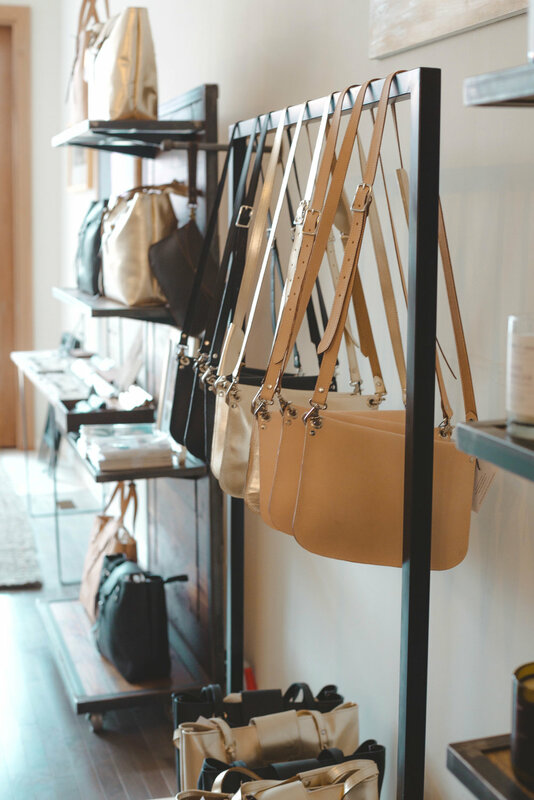 C: Dime and Regal was founded in 2015, in a small storefront on Division. The business grew for two years, but finally maxed its potential in the small space. 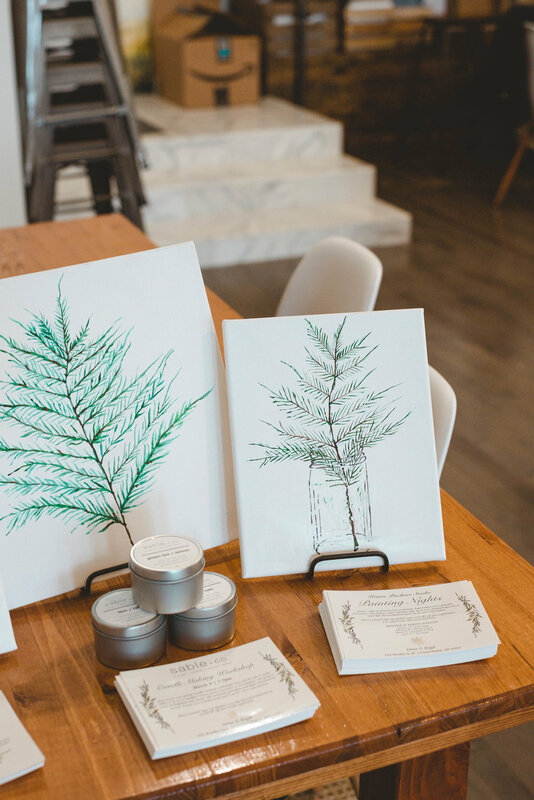 Samantha was a successful artist in the store and always hinted at finding a larger storefront-so 2017 was the time to take the leap. We created the partnership and moved the business into a bigger space, which was the foundation of this store we are sitting in. What is your style and inspiration? S: My line’s style is very simple. It’s minimalist, everyday wear. That is what I enjoy wearing myself. Inspiration wise I draw a lot from my equestrian background. I grew up on a farm, showing horses…that still informs my design. C: My line is also very simple, minimal, and what I am personally drawn to. I make things I like to wear. My line is called Sable and Co [sable meaning black] so I obviously have a fondness of greys and blacks…that is me and what I do. To be completely honest for both of us it’s a lot of line work…it’s items you produce over and over again. That ties into me being very competitive. I have thoughts like, ‘how many of these can I push out in an hour?’ I enjoy that part of it but not sure if that’s a good or bad thing (laughs). S: We are both slightly competitive with each other…it drives us to be better. She has a more Scandinavian style…she works with steel and unconventional materials. C: We are both simple and minimalist but mine is more solid and geometric, Samantha’s is more delicate and refined. What would you like people to know about your store if they haven’t stopped in before? C: We aren’t just one business…a group of 22 local businesses and artists who are supporting their families by selling their trade. S: Most of them don’t have a day job, this is it. So, when you shop here you are directly supporting those 22 people along with their families and households. All of our artists are from Michigan and most of them are from Grand Rapids. They aren’t just artists…they’re your neighbor. C: I kind of feel people are shifting their mindset. They are willing to spend the money to support their friends and neighbors who they know are working artists. S: Quality is a priority. The ‘Regal’ part of our name represents that quality…our products aren’t throw away items. What are your dreams for the future of the store? S: This was the dream (laughs). We haven’t gotten to the next one yet. We are looking to expand into our own…we would like to fill the space with even more artists. C: Taking this and helping it grow…to have the store expand and continue to bring more people in. S: We would love to be a household name in Grand Rapids that everyone knows; if someone is looking for a gift they come here first before heading to Amazon or Target. C: Would love to expand our product offering as well so that people feel they are able to do that. We have a lot of products that are geared towards women so we would like to incorporate more men’s items. We will be expanding a bit into clothing as well. What advice do you have for women in general especially those looking to start their own business? S: It’s certainly not easy…especially when you have children. -Ironically, as she is saying this her adorable son who is hanging out in the shop starts fussing. She gets up with a laugh to pick him up. C: Keep going even when it’s hard…when I was just starting out it was a struggle even to just do things like pay the rent. Just keep going. If it’s something you care about don’t stop. Talk to others in the industry. Get out of your studio…that is a working artist thing. It’s important to network and socialize. S: This is a tough industry, it isn’t for the light hearted…you do this because you love it not because you just want to be rich. We would love to be rich someday but this is what we love to do and that’s more important (laughs). C: I agree…of course who wouldn’t want to be rich but I am not going back to the corporate world just to achieve that. I am going to stay where I should be which is right here. I loved my time with these talented gals. The heart that they have for creating community, embracing the beauty of their craft, and supporting each other is so evident. They're the embodiment of 'community over competition' in it's truest form. Make sure to stop by Dime and Regal to check out all of the lovely. Supporting two strong women who have created a space for locality to thrive? You can't beat that.